Our multidisciplinary concussion clinic in Los Angeles is excited to offer comprehensive concussion management services to individuals and teams at all levels of competition in order to ensure safe, optimal, and speedy return to cognitive and athletic activities. 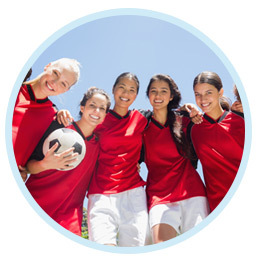 In addition to our comprehensive concussion services we have special interest in further understanding the unique qualities of female concussion and incorporating these findings into customized treatment options to these individuals. In the past several years, studies have gathered new and useful information on concussions. Concussion is so prevalent that you can now find clinics that specialize in children and adult concussion mainly because more information has shed light on the enigma of concussion. Because concussion falls within a spectrum of brain injuries, it’s difficult to know if when you need to go to a doctor or specialist at a concussion clinic. Sports teams are made aware of the risks of concussions, but even something as simple as a bicycle accident or a senior adult falling and bumping his/her head may cause a concussion. The brain is a complicated, integrated mass of activity. The brain floats in liquid inside one of the hardest bones in the body – the skull. If the skull is hit hard enough though it will cause the brain to slosh around inside the head and make contact with the skull. That bump causes a bruise to the brain or if it the hit is more severe, a more dangerous brain injury. If a concussion does occur, or you are concerned about a recent head injury (within the past couple of days) you or your child has sustained, find a concussion clinic right away. You can ask your doctor or look online for a list of concussion clinics near you. Doctors in these clinics specialize in concussion and know far more about concussion and how to manage one. If you are in the Los Angeles area, you are fortunate. Call One Neuro at 310-207-1720. They have a team of clinical neuropsychologists who have experience treating sports concussion and many other neuropsychological disorders. The best prevention is not to do any activity that can cause a concussion, however, that’s not practical or feasible. No one wants to live in a protective bubble. But you can do certain things to help prevent a concussion for you or your child. Wear the prescribed safety equipment and wear it properly – helmets for contact sports, seat belts and child safety seats while driving. Non-slip mats, handrails, better lighting for seniors. Even though a concussion is a mild brain injury, you can have lasting damage if you don’t follow doctor’s orders, get the proper amount of rest, and let your brain heal completely. Even if you feel back to “normal” follow the direction of your doctor or concussion clinic specialist and don’t return to school or work until he/she tells you it is okay to go back. Because of the complex and thorough nature of our evaluations, we like to initially meet with adult clients or a client’s parent(s) or legal guardians to review the developmental history and provide a focus for the assessment. During this meeting, we seek to identify presenting concerns and determine which evaluation will best meet your needs. Our assessment batteries are comprised of selected measures that are determined based on your presenting concerns and our ongoing impressions. Our evaluations are flexible and the clinician may add certain measures to the battery as they determine your unique strengths and weaknesses. Our assessment batteries vary in length and typically involve 1-3 testing sessions that may last 2 to 4 hours each. After the evaluation is complete, we will meet with you to review the results of the assessment in detail. We will also discuss treatment recommendations with you and provide appropriate referrals as needed. You are welcome to invite other treatment providers or family members to the feedback session. After this meeting, a full report is written, detailing the reason for the testing, the child’s history, the tests used, their results, the diagnostic impression (if appropriate) and finally, the recommendations for interventions.